Milan Kluko grew up in the south side of Chicago, was educated in hydrogeology and geochemistry, built a career centered on engineering and environmental auditing, and then did something extraordinary. He and his son Dan designed and constructed a state-of-the-art carbon-neutral farm inside an abandoned injection molding facility in New Buffalo, MI. “What I bring to the table is the business of vertical farming,” explained Kluko, who carefully collects data on the impact of everything from spacing to light recipe to the nutrient regimen per vertical stack. His end goal is to maximize efficiency and package not just the greens, but also the vertical farm design. “We’re doing this because we know we can feed people around the world. And we can do it in weeks; not years,” said Kluko, who explained adaptability, not technology, is the key. “This growing platform allows us to adapt and change with new technologies.” And the strategy is working. Each stack, or multiple vertical growing system (MVGS), is 16 feet tall by four feet wide by 60 feet long. 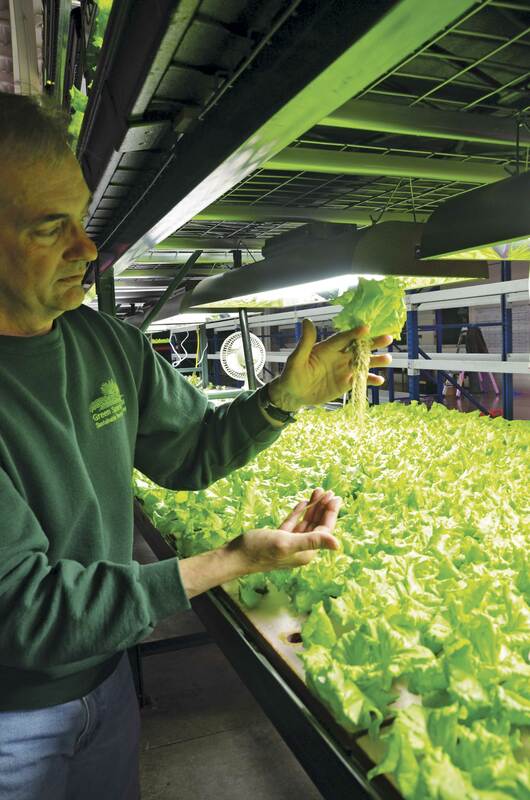 A single MVGS produces about eight tons of lettuce a year, an average that would require roughly the size of an entire football field for the soil-based grower. Moreover, in addition to the vertical grow space, with the right light recipe and nutrient regimen, harvest time is reduced from approximately 35 days to 21 days, meaning 17.38 harvests per year, versus 10.42 in a hydroponic greenhouse. “We take advantage of the vertical plane and create microclimates at each level,” Kluko said. The building stays relatively cool, but the temperature in each tray remains constant, making the system not only more efficient, but also easy to relocate as needed, an advantage over greenhouse or traditional hydroponic operations. The flexibility inherent in the vertical design is a perk for urban redevelopment. Buildings like the one in New Buffalo (left vacant for over a decade) may be utilized for indoor growing space. Where cost of land is a huge factor for many farmers, these vacant warehouses are often inexpensive and readily available. Not only does that mean a new tax base for hard hit cities like Detroit, where a second farm opened last spring; it also means jobs. Kluko said adding to the stress of a limited harvest window for conventional growers is the expense of soil amendments, fertilizers and costly equipment. “We eliminate most of that,” he said. Inputs on the farm floor are directly controlled. There are no external pressures from wind or water-driven erosion, nor insect or weather. Alterations in light technology brought about other significant changes. “Plants with full-spectrum light want to grow up to the sun,” Kluko points to the difference between a test tray of basil being grown under the older LED technology and another beside it utilizing the new LEDs. “These plants are about the same age, and the same yield,” however there is one key difference. The second tray of basil is shorter and squatter, with four-inch leaves and just four inches tall. The newer LEDs provide more of the light plants require (and less to be filtered out by the plant), creating basil that is broad, rather than leggy. Green Spirit Farms is currently shifting their operation away from induction lighting to the new LED lights. Not only does this move affect plant growth; it also improves spacing. Induction lights operate around 140 degrees while LEDs operate at about 90 degrees. The change meant they could improve stack spacing, increasing yield per MVGS. Additionally, Kluko meticulously monitors data, creating far smaller feedback loops than in conventional agriculture. “When we set the tank, we know we’re going to evap around 12 percent of that water. We have three years of data and can tell within the hour when we reach that level,” explained Kluko. “The farmer outside may be broadcast spreading. We’re only growing in an inch of water in the entire tray. When nutrients go through [the system], they’re in through the entire system in about 10 minutes.” This means alterations to concentrations of macro and micronutrients can be immediately adjusted with no impact on yield. Kluko said that though vertical farming is barely a blip on the radar today, he anticipates it growing into a half a billion-dollar industry in the next five to 10 years. Already Green Spirit Farms has licensed a facility in Detroit (Artesian Farms) and has plans to expand to other urban areas including Grand Rapids, Chicago, Columbus, Cleveland and Washington D.C. in the coming years. “We can feed the world locally. Whatever the local crop is, we can grow it in a warehouse building with very little water,” said Kluko. This means a smaller carbon footprint, a reduced cost to consumers, and the availability of same-day-harvested greens to “food deserts” or urban areas otherwise forced to import from California, Arizona, northern New Mexico, or regions outside the United States. Kluko said the shift toward local food is one he feels good about. “I don’t think I could do anything better with my life right now,” he concluded.